When Tom Bruce says “It’s all about timing” the New Zealand right-hander is not referring to the sweet power of his destructive strokeplay. For it was his 172 from 130 balls - including 19 fours and seven sixes - for Surrey against Sussex in a Second XI Trophy match at New Malden in late May that caught the eye of the away side’s coaching staff. And when South African Stiaan van Zyl suffered a knee injury which would require "an extended lay-off" Sussex knew who to move for to reinforce their Vitality T20 Blast campaign. The Central Districts batsman, who has played 14 T20Is for New Zealand, travels to Canterbury on Friday looking to make an impact against table-topping Kent after a quite start. In four T20 innings for Sussex Bruce has managed just 5, 10 not out, 3 not out and 10. 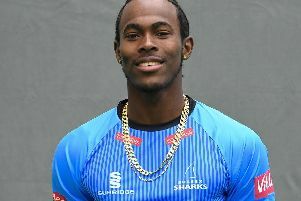 He said: “Everyone performs at different times and if I can just help Sussex win a couple of matches in the coming fixtures I will be happy. Sussex head coach Jason Gillespie said "The injury to Stiaan forced us to reassess our squad and we decided that we needed to bring in a quality overseas batsman for the duration of the tournament. Gillespie has relished the extra time his players have had to prepare for the Kent game following their championship destruction of Glamorgan inside two days. “Beating Glamorgan on Monday meant we could have a good session on Wednesday with just a light run on Thursday ahead of heading over to Canterbury on Friday. Kent have three wins and one defeat from five matches. Sussex have the same record having played one fewer game.